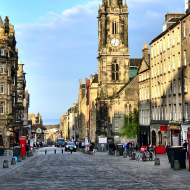 Tax, spending and support for business growth dominated last week's ICAS election hustings in Edinburgh. ICAS members in Scotland had the chance last week to quiz leading figures in four of the main political parties at a panel discussion held in Edinburgh. Chaired by journalist and broadcaster Kirsty Wark , the panel comprised: Ian Murray, Labour's Trade and Investment spokesman at Westminster, Liberal Democrat and former Scottish Secretary Michael Moore CA: the Scottish National Party MSP John Mason CA, Depute Convener of the Scottish Parliament's Finance Committee and Murdo Fraser, Conservative MSP for Mid Scotland and Fife. The debate, which took place on 25 May, was live streamed and the video can be viewed on demand. Each panelist had the opportunity to make their party's case for the General Election, taking place on 7 May. Murdo Fraser said that the tough decisions taken earlier by the Conservative and Lib Dem coalition government were now vindicated by better figures coming though on economic growth, investment and employment. He told the audience: "Now is not the time to change tack." John Mason stressed the SNP's commitment to a fairer society and said that if, as the polls suggested, the SNP make a strong showing at the Westminster elections, "…the SNP can influence UK policy, in a positive direction". He added: "For the first time in a long time, Scotland's voice will really be heard at Westminster". Michael Moore said the coalition government, with liberal Democrats and Conservatives working together, had rebalanced the UK economy, which was now one of the fastest growing economies in the advanced world. He quoted his party's election slogan: "A stronger economy, a fairer society, and opportunity for all." Ian Murray set out some of the key points in Labour's Business Manifesto, including increased funding for apprenticeships, a new approach to infrastructure planning and help for small business. Despite widespread speculation that a Labour government would be dependent on support from the SNP, he said: "We're not talking about deals. We're talking about social justice, supporting wealth creation, and a high-skilled economy." Questions from the floor focused on how the different parties would tackle the deficit, on the potential impact of "full fiscal autonomy" for Scotland, on the future of the National Health Service, on constitutional change and proportional representation and on policy issues raised in the ICAS Manifesto Counting on Change, launched on 25 March. These included tax simplification; pensions reform to ensure that people are encouraged to save for retirement; and ensuring that only qualified and regulated practitioners would be able to style themselves "accountants" when offering services to the public. On the latter front, the two CA members of the panel, John Mason and Michael Moore, supported ICAS's call for better regulation; while the proposal received a cautious welcome from Ian Murray and Murdo Fraser. The latter commented: "It's a reasonable proposition and worth looking at." Ian Murray said: "The government should be encouraging people to use regulated and kite-marked accountants. It's a real worry if accountancy services are not properly regulated." Concluding the debate, ICAS Chief Executive Anton Colella said that ICAS would be presenting its Manifesto again to whichever party or parties was in office in May. He said: "The institute will continue to be neutral, but we will be engaging in the political debate."